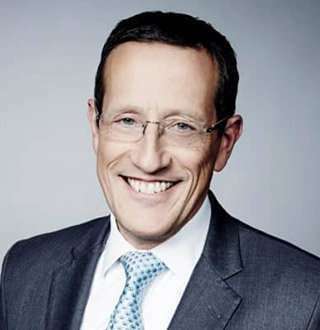 After spending his whole life hiding behind a closet, Richard Quest had a shocking revelation to make. The revelation had a positive effect on him as he had a big weight lifted off his chest and is reveling in his new found identity. The Liverpool native is CNN's elite international business correspondent and anchor best known for TV program Quest Means Business. He is also the host of CNN’s new TV program Quest’s World of Wonder, which started airing from July 2018. Richard entered the world of journalism in 1985 as a trainee journalist at the BBC. He joined its financial section in 1987. By 1989, he moved to New York to become the BBC’s North American Business Correspondent. He began working for the BBC from the United States as part of its then-fledgling BBC News 24 channel. He was the business correspondent reporting on, and discussing the world stock market in a regular segment World Business Report. In 2001, Quest joined CNN for the launch of Business International since then has covered a variety of different events. He has also been involved in CNN’s coverage of several occasions about the British Royal Family. On 9 April 2015, he became the host of the ABC game show 500 Questions only to be replaced by Dan Harris for the show's second season. He has also worked as an Aviation Correspondent for CNN; famously covered the story of Malaysia Airlines Flight 370, which disappeared on 8 March 2014. He followed the mysterious incident penning the book, The Vanishing of Flight MH370: The True Story of the Hunt for the Missing Malaysian Plane. On 8 March 2016, the book was published by Penguin Random House. Decades of working at one of the world’s top media company in CNN as a senior journalist, he was very succesful and loved. He commands a huge salary for his long service with CNN. Further associations with other media companies, as well as his best selling book have ensured him with a huge earning. He now boasts the net worth of $4 million. Born 9 March 1962, the 56-year-old is a native of Liverpool, England, having been born and bred there. He attended the state comprehensive Roundhay School in Leeds. He subsequently went to Airedale and Wharfedale College and the University of Leeds, where he studied law. He graduated with his degree in 1983 (Law LLB Hons.). During the 1983–84 academic year in the United States at Vanderbilt University in Nashville, Tennessee, he already managed to gain broadcasting experience. Later, he built the reporting staff from scratch as news director for campus radio station WRVU, putting his experience to display. And that experience led him to BBC as he was appointed the trainee journalist in 1985 for BBC's North American coverage. On 26 June 2014, Richard shocked the world as he revealed on air that he was gay. Richard described his past experience as a closeted gay man on his CNN television programme Quest Means Business, and questioned if him being a gay affected the people's credibility vested in him. "If I remember back to when I wasn’t open about my sexuality, I spent a great deal of time worried about it…. about what my family would think, what would my friends, my colleagues would think, and of course, what would you think. Would the fact that I’m gay affect my creditability as a business journalist? Would you watch the program differently?" He also added that he thought he might have to give up on his career if he opened up as gay, and saw himself as a sinking ship. However, when he opened up, he found out that there were his family and friends encouraging and supporting him, saving him from drowning; his worst fears- that he would lose credibility with viewers or the respect of his colleagues never materialized. The toll that he had to bear before his revealing was gone and it freed him to be more productive. The questions about him being married to a girl or having a wife became rhetorical after he revealed the truth to the public. having opened up about his sexuality he has regained his confidence and is reveling in his new identity.